Custom designed power packs to achieve optimum electro-mechanical and hydraulic performance for an extensive range of mobile and static applications. 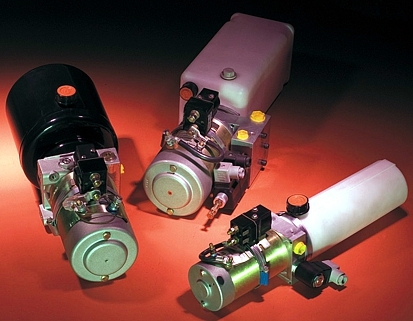 DC motor and multiple pump applications are a focused area of expertise. The HE power pack is based on a versatile platform that allows you to combine 80 - 134 mm motors (0.3 - 4.5 kW) with a variety of pumps (0.24 - 5.7 cc/rev). DC power systems are self contained modular power pack systems with a wide range of standard pumps, motors, switches, mountings, valves and reservoirs plus custom options. Short series of custom power packs built easily and cost effectively. Available fully assembled or in kit form. Extensive knowledge, extensive ability, extensive products. Customer needs are the centre of our business.